Welcome to the non-profit segment of the fearlessgirl.us site! The primary motivation for the site, non-profits who support our gender diversity goals for Fearless Girl, will be highlighted here. Fearless Girl was created in support of women in leadership positions, empowerment of young women, women’s education, gender equality, the reduction of prejudice in the work place through education, equal pay for women, and the general well-being of women. Now, please allow me to direct your attention to ReachingU, an organization promoting and funding education for the children of Uruguay. As the daughter of a U.S. Foreign Service diplomat, I was born in Montevideo, Uruguay and the children of Uruguay, like those at Los Rosales hold a special place in my heart. This video nearly brought me to tears. What does Fearless Girl mean to YOU? Enjoy! ReachingU, A Foundation for Uruguay is a non profit organization that works to improve education in public and private schools in Uruguay. In order to do that, ReachingU mobilizes resources from private donors and businesses to fund innovative educational programs that benefit the most vulnerable children. Los Rosales School is a full-time, bilingual (Spanish-English) girls’ school located in Casavalle, one of the poorest neighborhoods of Montevideo. ReachingU has been supporting Los Rosales since its opening in 2015. This school has implemented the Singapore Math Learning Method and an innovative socio-emotional learning program with 80 elementary school girls from extremely poor households. The results have been amazing. Four resin casts have been created as a light weight solution to spreading the message of the collective gender diversity goals. As creator of Fearless Girl, Artist Kristen Visbal advocates for supporting women in leadership positions, empowering young women, women’s education, gender equality, and the reduction of prejudice in the work place through education, equal pay for women, and the general well being of women. All goals the International Day Of The Girl Child goes a long way in support of. In the time since Fearless Girl was unveiled, few events have satisfied our goals for Fearless Girl as well as the International Day Of The Girl event does. Designed to draw awareness to the discrimination challenges young women face around the globe, the International Day Of The Girl Child promotes education and empowerment and prepares young women aged 10 through 25 to enter the work force and to assume an integral part of the global society. In order to achieve a truly diverse society, we must first and foremost educate, not only the young girls of the world but, those with whom she interacts. In so doing, we will foster and attitude of tolerance and good will towards one another. Fearless Girl will join the event. 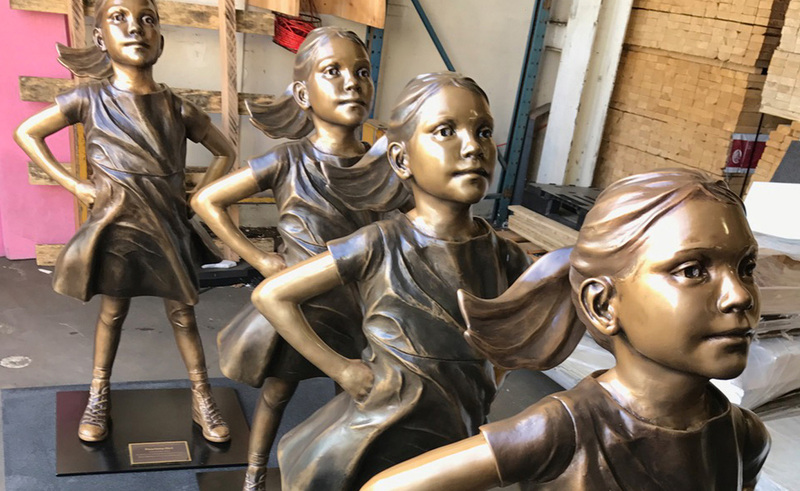 Kristen Visbal will join the global collection of leaders on behalf of girls and will exhibit a resin cast of Fearless Girl designed to support and empower girls. Paris will be this year’s global headquarters for the #GirlsTakeover event. As host to the first in a series of annual summits, the city of love will seek to enrich the well-being and tenacity of the girl. Paris will play host to the first of a series of annual summits in celebration of Day Of The Girl where long-term commitments, designed to foster the best in the girl, will narrow the gap between what is possible for girls and what they are allowed to be. Leadership will be the focus at a series of global events held at the city’s famous 4th district Hotel de Ville on October 11th. 400 global leaders from government, business, sport, entertainment and media will gather to support girls’ leadership.